This post is all about dorm room storage ideas. Affiliate links are used; read my policy here. Your college dorm room is your temporary home away from home, but it’s very tiny. And chances are, you’re gonna overpack and end up overwhelmed. But you don’t have to. 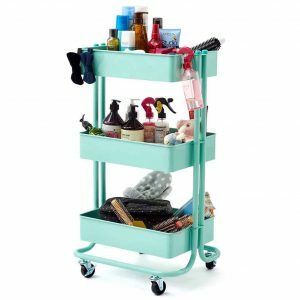 There are many genius dorm room storage items to help store the 50 nail polishes, 100 t-shirts, and 300 pairs of shoes you want to take to your college dorm room. Because let’s be real, while it’s best to not overpack, it’s hard. So why not figure out some ways to maximize your space to bring all of your favorite things? 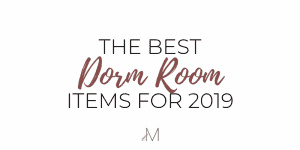 In this post, I’ll share over 30 dorm room storage ideas that will make your room more organized despite having a lot of stuff! One of the best things you can do is maximize the space under your bed. This is one of the best dorm room storage ideas to store miscellaneous items like cleaning supplies, flip flops, and more. Storage trunks are best for storing more delicate/fragile items. You can also use them to store extra clothes as the season changes. 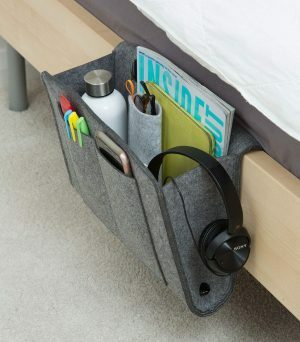 This bedside caddy lets you store lots of items like your headphones, books, phone, and other items right beside your bed for convenience. Not only is this furry storage ottoman a great space saver, but it’s also a great decorative piece for your room. If you have a shared bathroom on your floor or are just sharing your bathroom with your suitemate and don’t want to leave your things in the bathroom, then this is a great option. This mesh shower caddy stores all your bath essentials and allows water to seep through it to avoid wetting your room. Dorm closets are typically big enough for nobody, so you’re going to have to maximize your limited closet space. This is a great way to maximize your floor space to store your shoes. This is another great option for a hanging closet organizer. It has drawers that come with dividers to keep your clothes more organized and can hold up to 40lbs of items. These are a great option to hang multiple pairs of pants at once without worrying about them getting too wrinkled up. It’s also dust and rust-resistant and it’s smooth surface prevents wrinkles. This is an absolute lifesaver! Drawer dividers make your life easier by making things easy to find + maximizing your drawer space. This dorm room storage idea will allow you to keep all of your undergarments organized. No dorm is complete with storage bins! These can be used to store almost anything. It’s also great to put on top your closet to maximize the shelf space. This is by far one of the most popular and most useful dorm storage ideas to store almost anything! Have a lot of primers/foundations/serums etc? 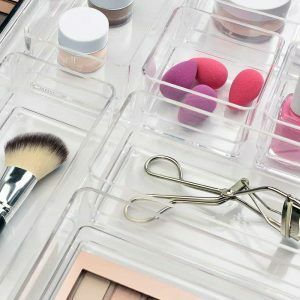 Get this 360-degree rotation makeup organizer to store them! These acrylic makeup storage organizers are very popular for storing makeup. Palettes, palettes, palettes! Whether it be your eye shadows, contour kits, highlighter palettes or whatever, now you’ll have an awesome storage item to store them. These are awesome for organizing your drawers! It’s very easy for your drawers to get disorganized with a lot of miscellaneous items. These will definitely help with that. Your desk is the one area of your room that’s prone to get messy if not organized properly. Use this desk organizer to keep your stationery organized and easy to find. 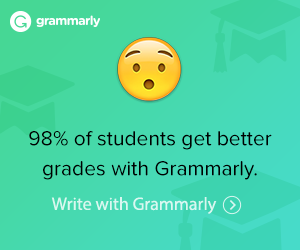 Planning on taking your desktop to school? Get this organizer to maximize your space and store additional stationery. Want to keep your desk more organized so you can be productive? Get this 4 piece set to store your stationery. Do you tend to have a lot of papers for class and other projects? This is the perfect accessory to store them. If you’re someone who prefers to physically take notes, you’re going to have a couple of notebooks. This is the perfect way to store them in between classes. How awesome is this?! 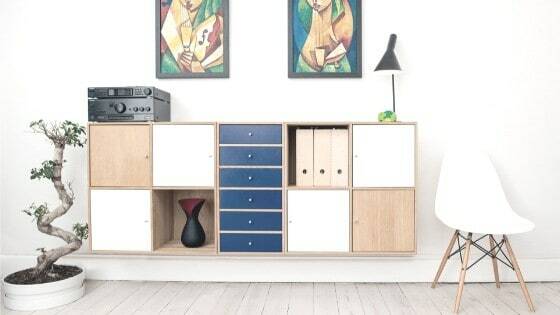 This shelf maximizes your space by allowing you to store multiple electronics and appliances in a central place. You can also add storage bins to the shelves on the left with snacks, DVDs, and other items. Have a mini-fridge? What better way to store your plastic ware than with an over the fridge pantry organizer? Have a lot of hair products? Or want a convenient way to store your snacks? Get this convenient cart! If you’re a fan of meal prepping, get these containers to store your delicious foods! If you’re a fan of tea like I am, this is a great way to store all your tea bags. Get rid of all your bulky food boxes and get these clear, airtight containers to store your cereals and grains. This is a great addition to your kitchen if you have an apartment/apartment styled dorm. Otherwise, you can also use it to store snacks, keys, and other items in your dorm room. Store all your jewelry in one place with this stylish organizer. This is another awesome way to store your jewelry. It can also hold some perfume bottles and a small wallet. This hanging jewelry organizer is perfect for all of your fashion jewelry. It can also hold other items like bows and more. Need an all-in-one solution to store more than just your jewelry? This is the perfect way to do this. 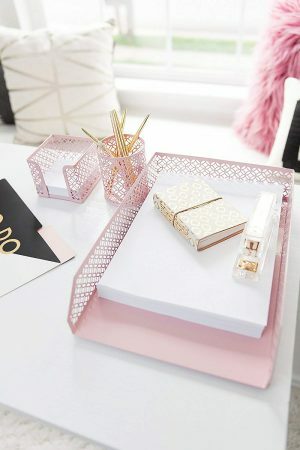 This organizer doubles as a mirror and has way more space to store things like perfumes, makeup, and skincare products. This hanging organizer can hold your jewelry and other larger items like wallets and belts. I hope you liked these dorm room storage ideas!